"Be it known that I, James L. Plimpton . . . have invented a new and useful Improvement in Roller and other skates." 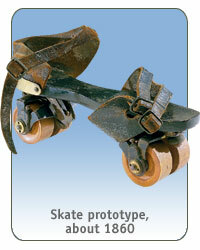 Plimpton's patented skate was the first of its kind. Rather than affixing the wheels directly to the plate of the skate, Plimpton designed his skate like a wagon wheel so that it could move independently of the plate itself. This allowed the skate to "rock" and, therefore, turn more easily than its predecessors. In 1863, James L. Plimpton changed the skating world forever when he patented the forerunner of the modern roller skate. Safer and easier to use than existing versions, which were little more than wheels attached to rigid boards, his "rocker skate" allowed skaters to steer simply by leaning left or right. Roller-skating boomed. In the 1860s, Plimpton set up a skate factory and opened America's first roller-skating rinks in New York City and Newport, Rhode Island, where he leased skates to customers. Skating soon became a popular family activity. The New York Roller-Skating Association—the first of its kind—and other clubs held speed and distance competitions in cities across the United States.